Making reclaimed wood furniture has become a very popular branch of woodworking as of late. Mainly due to the often low cost of salvaging wood when compared to buying new processed virgin wood, in addition, weathered or discolored wood can add a great deal of character to the projects it is used for. Reclaiming wood is also often referred to as recycling wood and rightfully so as it holds a great advantage for the environment. Think of using reclaimed wood as saving a tree that didn’t need to be chopped down to meet the demand for lumber. Salvaging processed lumber from its original use to repurpose it in a different application. Salvaging wood from old structures such as barns, decks or floors are a great way of getting your hands on some choice lumber to incorporate into your woodworking projects. There is, however, a downside to working with reclaimed wood. Unlike a quick trip down to the local mill or wood merchant where you can shop for the dimensions needed to satisfy your next project, in the case of reclaimed lumber, it is not as convenient. In these cases, the often labored process involves dismantling the wood from its original use, stripping the old finish to the desired look and finally sizing the wood to suit its use. Reclaimed wood needs to be graded. Reclaimed lumber has often suffered some degree of deterioration due to exposure to the elements over a certain period of time. This can be as a result of weather, fungal or parasite damage and may result in discoloration, warping, rough surface and weakening. It is for this reason that reclaimed lumber should undergo a level of grading to determine the appropriate re-use of the lumber. Reclaimed lumber with a high level of decomposition is popularly used for landscaping, while rough and discolored wood can be used to make rustic furniture. 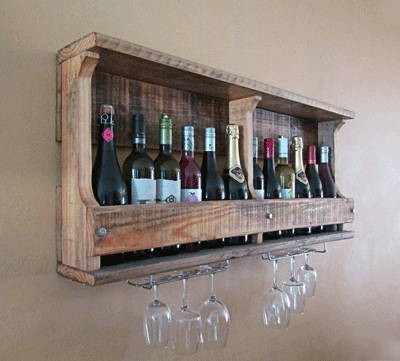 A wall mount wine rack made from wood reclaimed from a shipping crate. Rustic is in and nothing gives a more rustic look then reclaimed wood. Ripping up old floorboards and using them to build a farm style coffee table or using the wood from a old wine barrel to build stools and chairs can add a unique themed flair to the area these objects will be displayed. Although articles made using reclaimed wood is more often used for decorative purposes it should not mean it can’t have a level of functionality. Reclaimed wood can also be salvaged and milled to bring the lumber close to newly processed state like the woods you will find for sale as “reclaimed” and are more often the woods with low levels of deterioration. This however requires specialized equipment like thicknessers. A thicknesser will remove the outer layer of rough, discolored wood often exposing a true gem hiding underneath. So giving new life to the old weathered plank that was stripped out of that old barn or level out the scuffing from all the years of walking on that old floor. If the lumber is not in a state of deterioration, just running a belt sander over it to strip away surface impurities can produce quite a clean finish also. When working with reclaimed wood it is very important to remove any embedded metals like screws or nails. If not removed they can cause serious damage to carbide tipped saw blades if the two had to meet while sawing. 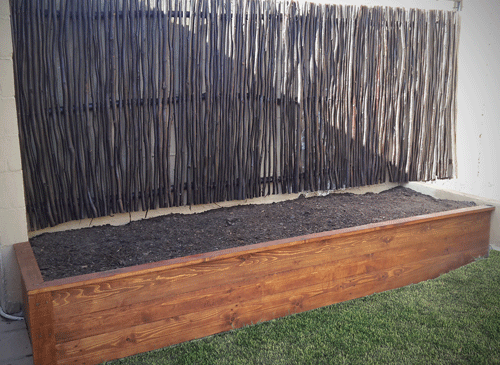 A raised planter built using reclaimed wood. Working with reclaimed wood as a beginner. When finding your feet in the woodworking world, working with wood from dismantled pallets or shipping crates is a great way to practice your craft with minimal expenditure on the material. These can be obtained fairly easily and at low cost and be used to build planters, outdoor furniture, dog kennels, decorative fixtures etc. If the woodworker does not possesses the patience to dismantle the pallets, dismantled pallets can be purchased from suppliers. Dismantling is important because, as was mentioned earlier in the article, saw blades and nails are not friends. Real nice site. I have always thought that old barn wood would make some neat things like wood paneling. I am not much of a carpenter but it is interesting. No shortage of old wood in Kansas ! Do you know if there is a market for old wood? My wife works in a one-stop-shopping store. When pallets break and cannot be used she brings them home and I break it apart to make something out of it. I’ve made garden boxes mostly but some crafts. They look rustic and people who visit love the look. I also find old broken furniture selling for under $10 and repair them, sand, stain, etc. they look really nice. Working with wood is a relaxing hobby. Yes, woodworking is a very relaxing hobby and what you’re explaining is exactly how I originally found my feet. As I mentioned in a older article. Restoring old or damaged wooden articles is also a great way to practice. Often these articles just need a fresh coat to give them new life. Is there a big market for reclaimed wood? I have an old barn on my families farm that is going to be getting knocked down. How would I go about getting someone who wants that wood to come get it? I can’t exactly vouch for a general market with regards to location but I have experienced a market for reclaimed lumber. People are generally looking to buy reclaimed wood for one of two reasons. These being, to save cost’s or to acquire wood with certain characteristics. The problem is finding the buyer that is in the market for the wood you are looking to sell. Be it with regards to amount, quality or type. The fastest way of finding that buyer would be online. To advertise the barn just like you would sell anything else online. I have seen people make a living from salvaging railway sleepers to sell to people that make very unique furniture. I’m so happy that this article has inspired you. Ultimately that is what we are trying to do. Woodworking is a very rewarding hobby. Amazing article, brother! I have made my own projects from reclaimed wood flooring before, and I agree with you that it’s best for newbies to start from dismantled pallets or shipping crates. I am no expert, and even after many projects created, I still love your raise planter in the picture! I have never thought about creating one of those. But I think it’s time for me to take action. Cheers! Wow, this was a wealth of information about the great benefits of dismantling old barns, very thorough and I really like that part at the end where you talk about dismantling crates and pallets for beginners. This is something that has always interest me, and now I know where to start, thank you! We got old barns all over my area ready to tear down! Great article with lots of awesome info. Love working with reclaimed and the look of it cannot be beat. Do you have any recommendations for where to get quality reclaimed wood? Sources I’ve found are good but its such a hot commodity right now that you’ll pay a ton. As you say, the look and feel of furniture produced from reclaimed wood has become hugely popular and so, have generated a large demand for such woods. I’m from New Zealand and our Native trees are protected these days due the fact that they take 1,000+ years to mature. So we use a lot of reclaimed native timber. We call it “recycled”. I am always interested in your posts as I live in a Motorhome that I converted myself. A lot of wood working lol. I have lined it in recycled “Rimu” sarking, native timber. As this timber gets older it hardens and you always have to drill before screwing is that the same with US timbers? Most of your hardwoods are very dense whether they are aged or not and unlike your softer woods like pine, just driving a screw into the wood is a bit of a task. Personally, whether working with hardwood or softwood I always drill a pilot hole first. I’ve been wanting to make some new shelves for my living room. I would love to use reclaimed wood. I like the rustic look it would give. I didn’t know that I would need to make sure the wood is graded first. I will have to make sure I do this. I’m sure old wood has been through a lot of warping and deterioration, like you said. In some regions, you can purchase graded reclaimed lumber however if you salvage the wood yourself it would obviously not have been graded. In these cases, this is something you would have to do yourself. It’s fairly simple to determine if the wood is too deteriorated for your intended purpose but also keep in mind the range of possible treatments used on the wood. For example, it might not be the best idea to make a dining table or chopping board with wood previously treated with pesticides.